Aman Cotton Fibrous Limited IPO Lottery Result 2018. Aman Cotton Fibrous Limited IPO Lottery Result have been published on 04 July 2018. Aman Cotton Fibrous Limited Subscription Open from June 03, 2018, and Close on June 10, 2018. Aman Cotton Fibrous Limited IPO Lottery Result updated. 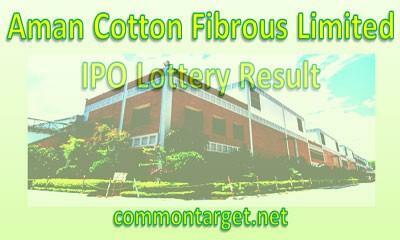 Download Aman Cotton Fibrous Limited IPO Lottery Result that will be published & found here. IPO or an Initial Public Offer (IPO) is the first sale of a stock by a private company to the public company. In this way, a company can increase money by issuing either debt or equity. IPO or Share market inauguration is a type of public offer in which shares of a company generally are sold to the predictable investors that in turn, sell to the general public by a securities exchange for the first time. Aman Cotton Fibrous Limited IPO Lottery Result found here. Bangladesh Securities and Exchange Commission (BSEC) has approved the initial public offering (IPO) of Aman Cotton Fibrous Limited on 13 February 2018 at their 629th board meeting. BSEC approved the IPO of the company to raise capital of Tk 80 crore from the market through book-building method on July 24, 2017. Bangladesh Securities and Exchange Commission (BSEC) on July 24 last year to conduct the electronic bidding for determining the cut-off price for its initial public offering. Aman Cotton Fibrous Limited conducted electronic bidding in July 24 and the cut-off price has been fixed at Tk 36 each, including a premium of Tk 26 for each Tk 40/ share for the eligible institutional investors. As per the bidding of EIIs, the cut-off price of the company’s shares stands at Tk 40 which will be allotted to general investors along with NRB investors at Tk 36 each. Under the amended public issue rules, of the 2.08 crore IPO shares of ACFL, 1.25 crore will be allocated to EIIs, 0.83 crore shares will be offered to the General and NRB investors., as per the book-building method. According to the financial statement for the year ended on June 30, 2017, the company’s net asset value (NAV) per share is Tk 39.12, including revaluation reserve, whereas the value is Tk 35.80 without revaluation reserve. The earnings per share (EPS) was Tk 3.46 for the year ended on June 30, 2017. ICB Capital Management Limited have acted on behalf of the company’s issue manager. The company’s IPO fund will be used to purchase machinery, to repay bank loans and to bear IPO expenses & IPO related other relevant expenses according to the IPO prospectus. 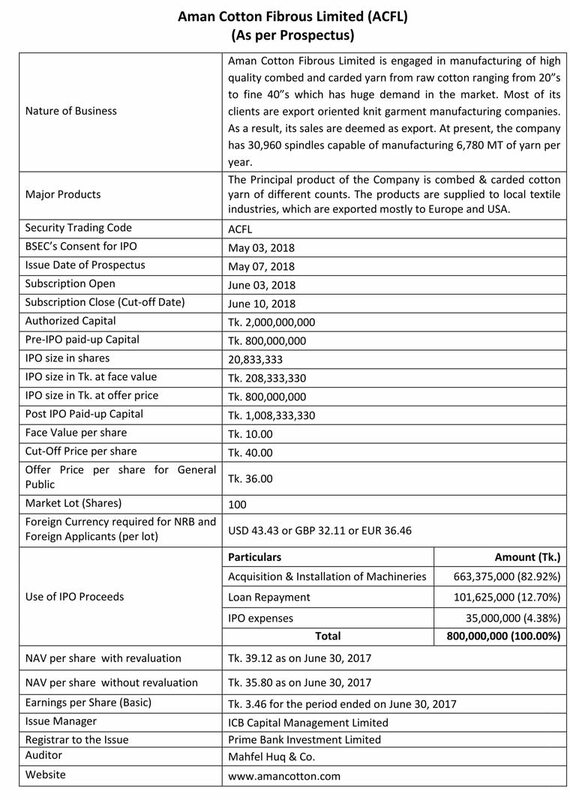 Aman Cotton Fibrous Limited IPO Lottery Result 2018 published on 04 July 2018 & found here. Download Aman Cotton Fibrous Limited IPO Lottery Result from here. After ending of application of Initial Public Offer (IPO) from 03 June 2018 to 10 June 2018. Aman Cotton Fibrous Limited IPO Lottery draw held on 04 July 2018. Place: Engineering Institute, IEB Millaniton, Ramna Dhaka at 10:30 A.M. The IPO results will be published on the websites of Dhaka Stock Exchange (DSE), Chittagong Stock Exchange (CSE) and the company’s website after the lottery programme. See the Result below. Issue Manager: ICB Capital Management Limited have acted on behalf of the company’s issue manager. The Company was incorporated as a private Limited Company with the issuance of certificate of incorporation bearing No. : Raj-C-403 dated December 28, 2005 by the Registrar of Joint Stock Companies & Firms. The Company commenced its commercial production on November 01, 2007. Subsequently the shareholders in their Extra-ordinary General Meeting held on April 22, 2012 approved conversion of status of the company from private limited to public limited company. Registered office of the Company is located at 2 Ishakha Avenue, Sector #6, Uttara, Dhaka. 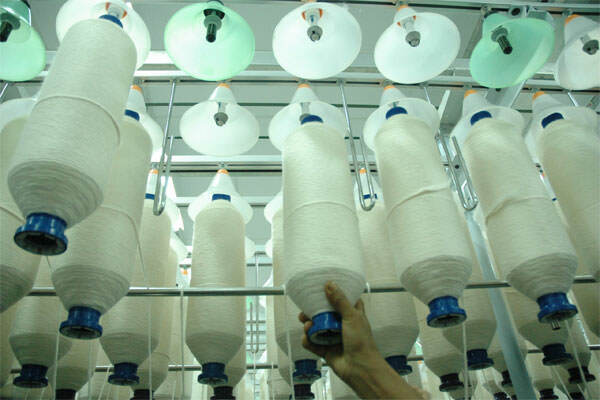 Aman Cotton Fibrous Limited is mainly engaged in manufacturing of high class yarn in Bangladesh and marketing and selling of product in the worldwide and domestic Market. The installation of a high capacity air conditioning and filtration plant has enabled the mill to meet the international standards. The Company manufactures 100% cotton Carded; Combed & Semi combed ring spun grey yarn for knitting as well as weaving. From the beginning of operation of ACFL, it has managed to comply with the international standards of management, which was reflected in the attainment of ISO 9001:2000 Certificate that was conferred for fulfilling the norms of ISO standard in every step of its management of the plant. The factory is located in the village Boiragirchala in the Sreepur Upa Zilla of Gazipur district. It has 116,000 sft. main factory building with another 20,000 sft. Covered area for quality control, utility, store, workshop, dormitory, office & others. Aman Cotton Fibrous Limited possess an installed capacity of 30,960 spindles capable of producing 5,631,624 Kgs of cotton yarn per year. All the machinery imported from Germany, Switzerland, Italy, Japan & China are contemporary, high-tech and hi-speed most modern machines to spin the finest quality cotton yarn conforming to global standards. If you want to get the available information regarding “Aman Cotton Fibrous Limited IPO Lottery Result” please always stay and follow this site Common Target.